New Knee gives New Outlook to McLaren Joint Replacement Patient W 401 S. Ballenger Highway | Flint, Michigan 48532 www.mclaren.org/flint Physician Referrals 1-877-McLaren (625-2736) McLaren Physical Therapy and Sports Medicine Locations 505 N. Dayton Street, Davison Phone: (810) 658-5631 G-3239 Beecher Road, Flint Phone: (810) 342-2356 2500 N. Elms Road, Flushing Phone: (810) 342-5550 Physical Therapists who specialize in working with orthopedic patients, including those who have had total knee, hip or shoulder replacements, are available at all three McLaren Flint outpatient therapy locations. If you have questions regarding any type of outpatient physical or occupational therapy needs, please call any of the locations listed here. hen your job requires you to be on your feet and moving 10 to 16 hours on any given day, and you love to walk and be active, chronic pain is simply a nuisance. Just ask DeWinter Holloway, age 60, of Flint, who decided she had, had enough. “I had very sharp pain in my left knee,” states DeWinter. “It was even starting to dislocate when I walked. It was very painful going up and down stairs. At work I had to take breaks, which I had never done before, and the pain was waking me up in the night. I knew it was time to do something about it.” After doing online research and consulting with friends, DeWinter scheduled an appointment with Orthopedic Surgeon Norman Walter, MD. Oral medications and corticosteroid injections did not provide relief to DeWinter so she decided to have a total knee replacement at McLaren Flint on January 17, 2017. “It is hard to believe the same day I had surgery I was walking and doing exercises,” shares DeWinter. “The nurses and physical therapists were always helpful. I had some fear I would fall, and they were right there to make sure I was ok. My advice to other people suffering with chronic knee pain is do not put off going to see a specialist,” states DeWinter. “It is only going to get worse and continue to interfere with your normal activities.” DeWinter put her knee to the test in May when she returned to work for her 21st year as a Crime Scene Identification Technician with the Flint Police Department. 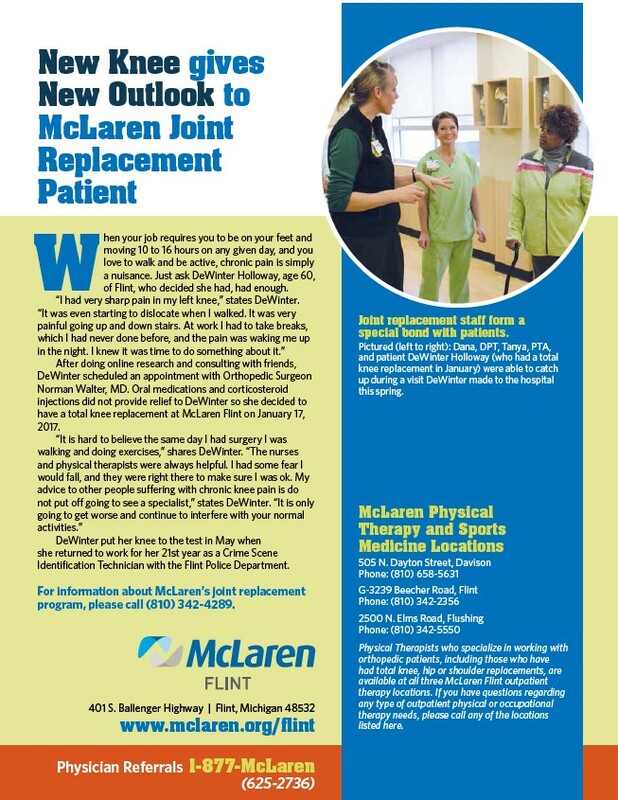 For information about McLaren’s joint replacement program, please call (810) 342-4289. Joint replacement staff form a special bond with patients. Pictured (left to right): Dana, DPT, Tanya, PTA, and patient DeWinter Holloway (who had a total knee replacement in January) were able to catch up during a visit DeWinter made to the hospital this spring.